The days of mono for me are over. I'm rigging all mine with Power Pro. I think I'm going to use 10#. It has the dia. of 2#. No strech and great sensitivity. Do these super lines still slide through slip bobbers ? Yep, they will slide through slip-bobbers. I like to use 8 or 10 pound test Fireline for my jigging rod for pike. Get a great hookset and has a lot of strength. I've been using Power Pro for the last couple years, and Fire Line a couple years before that. I bought a new ultra-light last year and rigged it with 4# Mono. It felt like I was fishing with 3 pairs of gloves on. I couldn't feel anything, had jump out of my seat to get a good hook-set. I will never go back to mono on my ice rods. I really like Power Pro, doesn't fray as much as Fire Line. Slip Bobbbers are no problem, the only thing you have to watch is the bobber stop moving on the line. The "dog bone" style or the rubber stopper type work the best for me. I do use the string type but I usually have to adjust after every fish. Not a big problem if your using a vex. 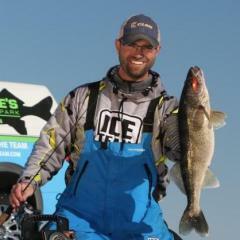 Matt, ever tried the 4lb fireline (inside a shack, obviously) for jigging panfish? I have a hard time believing that the superlines are any benefit for gills and crappies - I would imagine they hinder the bait's action quite a bit. I mean, the 10/2 powerpro is not really 2lb diameter, if you compare it to a good quality 2lb mono or fluoro line, it's no comparison, in my book. Being from the Stoneage I pretty much use Mono in all cases. Are these new lines limper then Mono when they are cold? Bobberboy - I've heard that powerpro does ok in the cold, but fireline tends to soak up water and freeze - not good. But generally speaking, a good quality ice mono, or even fluorocarbon, is going to be more limp than a superline in cold weather. That's why I can't see using a superline for any light line type application, such as panfish jigging. Like Matt said, the lightest application I can see for it would be jigging perch deep, where the enhanced sensitivity would be an asset. I think powerpro could be good for walleye or pike jigging - obviously with walleye you'd want to add a fluoro or mono leader, since the superlines are opaque and stand out like a sore thumb underwater. Pike, I'll bet the stuff would rock, as long as you have a slower action rod to go along with it - you need some give in your system somewhere! But for the extreme light baits and lines of panfish jigging, I still think mono or fluoro is the way to go. Has anyone had a chance to use Tuf-line XP or Tuf-line plus? If so was wondering what you thought of it. Looks like it might be a good choice for ice also. I really like using Fireline for the sensativity but I set the hook too hard (old habit I've never been able to break) so I do better with a little stretch and stick to Mono. My biggest problem with Mono is line memory and twist, I tried IronSilk last season and it worked pretty good but I'm going to give P-Line a try this year. Has anyone tried this stuff before? My opinion.. and its just that.. an opinion... I use a lot of braid for open water when you are making long casts when you can really get hooked up in some nasty cover. I use a lot of superlines for icefishing. If Im worried about the fish seeing it I tie on a shocker leader of mono. I really like the 2-10# power pro for eyes. If Im going after deep crappie I will use power pro or fireline with a leader of Florocarbon. My bobber rods are all mono. Slip bobber knots tend to cut off when sliding up and down superlines and you dont need the feel of power pro or fireline on a bobber. I also use mostly mono on my deadstick on my Rock n reel or tub mount rock n reel. I love how sensitive you can set your rod with them. If you sit outside a lot stay with mono because the superlines all hold more water and freezup is a issue when in the cold. Nope, but I stick to mono for my panfish. Flourocarbon sometimes too. I have however fished with 4lb tst Fireline for perch and I still prefer mono. I have some friends that fish Fireline pretty regularly in the winter for all species and do alright though. The only thing I use spiderwire for is laker fishing in really deep water. The reason for this is the stretch and sensitivity factor. When your 50 feet down mono just doesn't cut it. The problem I have had with superlines is that they tend to freeze solid when they are exposed to the air, mono will get ice on it,but you can always break it off. Even when I do use spiderwire there is always a ten foot fluoro leader so fish dont see it. Anyway that is my take on it so there!!! I have fished with guys using fireline and you really need to use a leader. I use flouro and it outfished fireline many times over. Mono works best for slip bobbers tho. Resetting your bobber stop is a pain in the neck specially when it ends up 2 feet from the bait and your in 21 feet of water. I use flouro for mainlines and dont fool with spectra lines or leaders. Exudedude is a punk. How ya been? "XP" from Western Filament would be a excellent line to use. It is made out of 100% Spectra same has Power Pro but "XP" is more supple. I have used "XP" the last couple of winters and have been very pleased with the perforamnce. The cost of "XP" is also less than Power Pro. Tuf-Plus will hold more water and have a better chance of freezing up. Thanks for sharing. You confirmed my suspicions and I have decided to give it a serious trial this winter. I will let you guys know if it works out. I usually use mono for anything other than deep water fishing for lake trout. I have a problem with firewire and spiderwire sending my fl-18 into a tizzy. I get a full screen of garbage when I use them. Maybe there is something wrong with my Vex? Anybody else experience this? At times braided line will hold air in side the braids of the line or air bubbles will cling to the outside of the line. This will cause interferance on the locators. I've used Vanish the past couple of years, and have quite often outfished those around me. So I really like it,however,line twist is a concern at times. Is this common for all flouros? IcePro where can I find XP and who makes it? I fished 2lb Vanish on a couple of my rigs last year. It was great stuff, and I had none of the line memory problems that I've heard about - I'll probably go with it again, although I also might put 2lb Stren Golden with a fluoro leader on all my light light rigs - that's a great combo that I used last year as well. I also have one rod rigged with 3/4 lb nylon sewing thread :-) On my crappie/perch rods, I'm going to put 4lb Cajun Red Cast - looks like very good stuff - I like the high visibility above the ice, coupled with the low vis below. I might even pick it up in the 2lb variety, we'll see. I have used the 4lb test 2 lb diameter Fireline for several years on noodle rods and really like it. Easy to see the bites and soft on the hook set. i use vanish to. you just can't beat its sensitivity, and its near zero stretch. however, the line memory can be a challenge at times.....by jigging for a bit i can usually straighten it out. this only applies to my walleye rigs that have heavier test.